1. Go to the Tests tab. By default, you’ll see the list of all the test previously created if any, otherwise the ‘No test to show’ label will be displayed. You may select a Suite to display only those tests created by the selected Suite. 2. Click on the Add Test button to create a new test or edit an existing test by clicking on its name. 3. Before the test editor will load you may select the suite where the test will be located. Enter the test name at the top text box. 4. Simply write out the test steps separating each one with a blank line in between (hit the Enter key twice after each step). Add text formatting as you like. 5. To indicate an expected result, type => and write the expected result after it. 6. 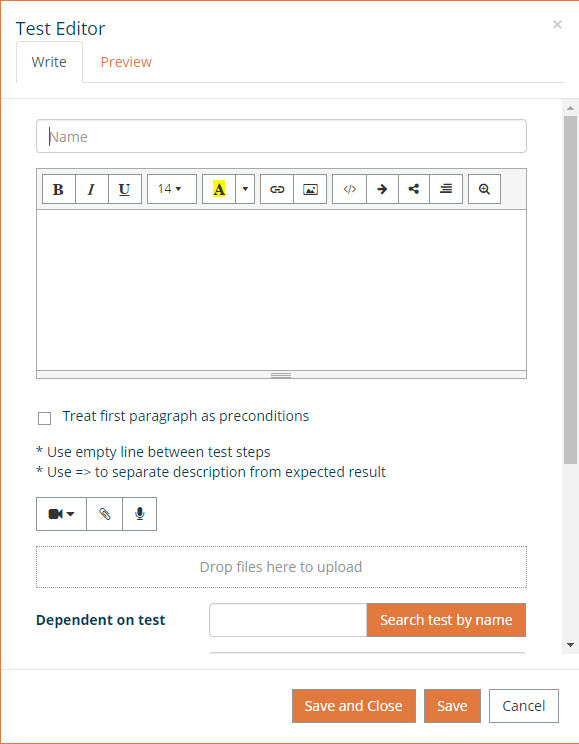 To add preconditions, use the first lines of the test editor as preconditions and then tick the Treat first paragraph as preconditions option. 7. You can attach a file to the test clicking the Attach File icon or simply by dragging and dropping the files on the bar Drop files here to upload on the test editor. 8. Take a look at the Test preview by clicking on the tab Preview where you may follow your work in progress and how the test will be seen. 9. Once you are finished don’t forget to Save the test.